When you get back from a weekend of binging in Las Vegas, you might find that you really crave salad. Not the wimpy kind with delicate garden lettuces, but a big bowl of raw vegetables that promises to cure all your ills. If you were a cheffy chef your first instinct might be to go to the farmer’s market to gather up your vegetables. If it’s Saturday night, though, chances are you’re too late for a farmer’s market. So you have two options: go to a restaurant that serves a big farmer’s market salad or make a salad from supermarket vegetables. Me? I’m the master of the latter. Notice how un-farmer’s markety that looks (Alice Waters, shield your eyes). 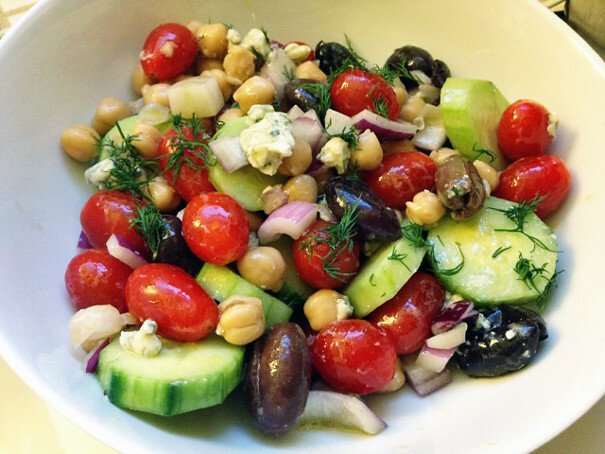 But this is all you need to make a big bowl of goodness at home: cherry tomatoes (because they’re consistently good regardless of season), an English cucumber, a red onion, a block of blue cheese (we can’t be too virtuous), kalamata olives and a can of chickpeas. When Craig’s here and I make a salad like this, I cut everything very small. When he’s not here I cut everything large and it takes the smallest amount of time. 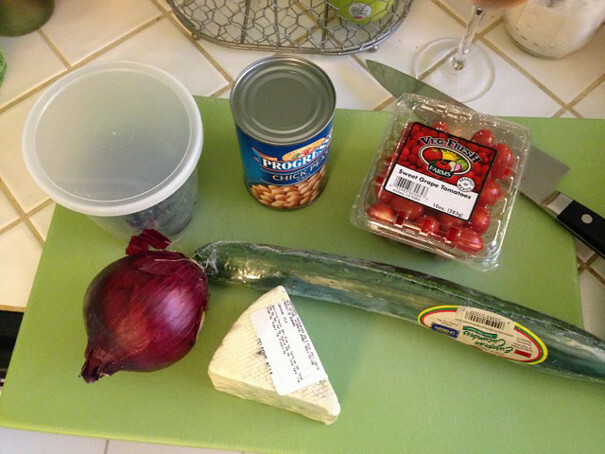 Peel the cucumber and cut it into large rings. Put the cherry tomatoes in whole after rinsing them. 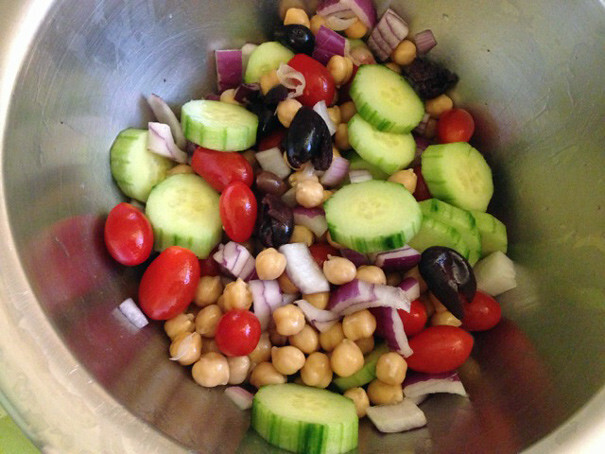 Drain the chickpeas, add them (don’t bother rinsing them, it’ll get water in your salad). Pit your olives. Chop your onion into large pieces. 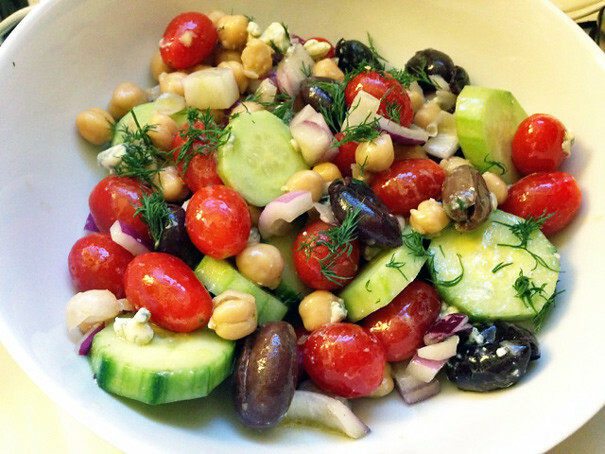 For this particular salad, I sprinkled everything with salt, tossed it, then added a glug of olive oil and a glug of red wine vinegar, tossing with my hands and tasting all the while. When it tasted right I added some of that blue cheese crumbled up and some dill I had leftover in my refrigerator. If you want a more emulsified dressing, a mustard bottle vinaigrette would be great here. Serve it up with a glass of rosé (my personal choice this evening) and you’ve got a big bowl of virtuousness that’ll absolve you of all your Vegas sins. Well, almost all of them.